THE ROCKS will - weather permitting - be in action this weekend. But who are they playing and when? Well, how long have you got? The situation, first reported here on Monday, has been further complicated by the postponement of Tuesday night’s FA Trophy replay between Leamington and Altrincham. “As supporters will be aware, we are due to play the winners of the FA Trophy first-round replay between Leamington and Altrincham in the second round at Nyewood Lane on Saturday (January 16). “However, due to the recent wet weather and problems with Leamington’s pitch, their replay has been postponed on four occasions. “It was hoped it will be played this Tuesday (Jan 12). But it has been postponed again so it should now be played on Thursday (Jan 14). “Should it still not be played on Thursday, it will be played on Saturday (16), which would mean the winners would come to Nyewood Lane to play us next Tuesday (19). Cook continues: “We have discussed moving our Ryman League match with VCD Athletic, currently scheduled for Tuesday, February 9, to this Saturday (Jan 16) if Leamington v Altrincham has still not been played on Thursday. 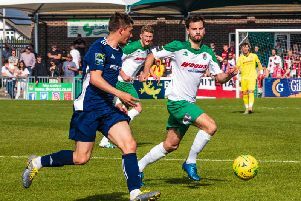 One other rearrangement in a season full of them... the league match at Burgess Hill Town, rained off on January 2, will be played on Wednesday, February 24 (7.30pm).